Three-Angled Rattlepod is an annual herb, erect to ascending, up to 50 cm tall. Branches are 3-angled, velvet-hairy. Stipules are linear-lanceshaped, about 3 mm, falling off. Leaves are simple; leaf-stalk about 1 mm; leaf blade elliptic-ob­long, 2-3 × 0.7-1 cm, upper surface pellucid dotted, sec­ondary veins 7 or 8 on each side of midvein, base rounded, tip blunt. Racemes at branch-ends or leaf-opposed, 1-3-flowered. Flower-stalk is as long as calyx. Calyx 2-lipped, divided to about 1/2 its length, velvet-hairy; sepals triangular-lanceshaped. 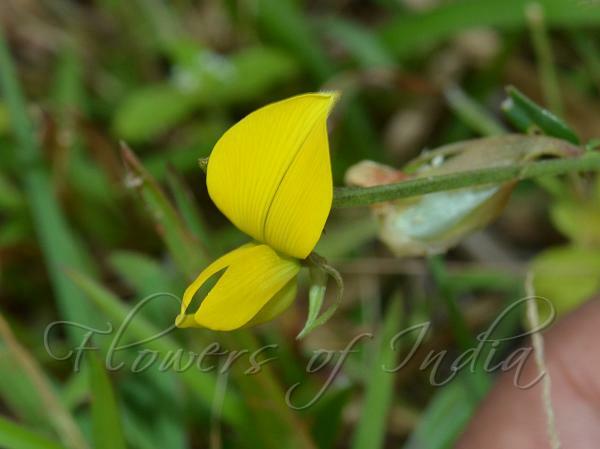 Flower are pale yellow, 1-1.2 cm, longer than calyx; standard ovate, base with 2 appendages; wings oblong, slightly shorter than stan­dard; keel ± as long as wings, angled near base, beak straight and twisted. Legume cylindric, about 2 cm, about 16-seeded, pu­bescent. 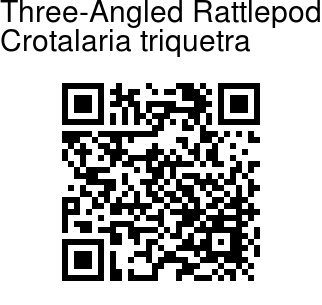 Three-Angled Rattlepod is found in open grasslands, wastelands below 300 m, in S Taiwan, India, In­donesia, Sri Lanka. Identification credit: M.V. Krishnaraj Photographed in Nelliyampathy, Kerala.